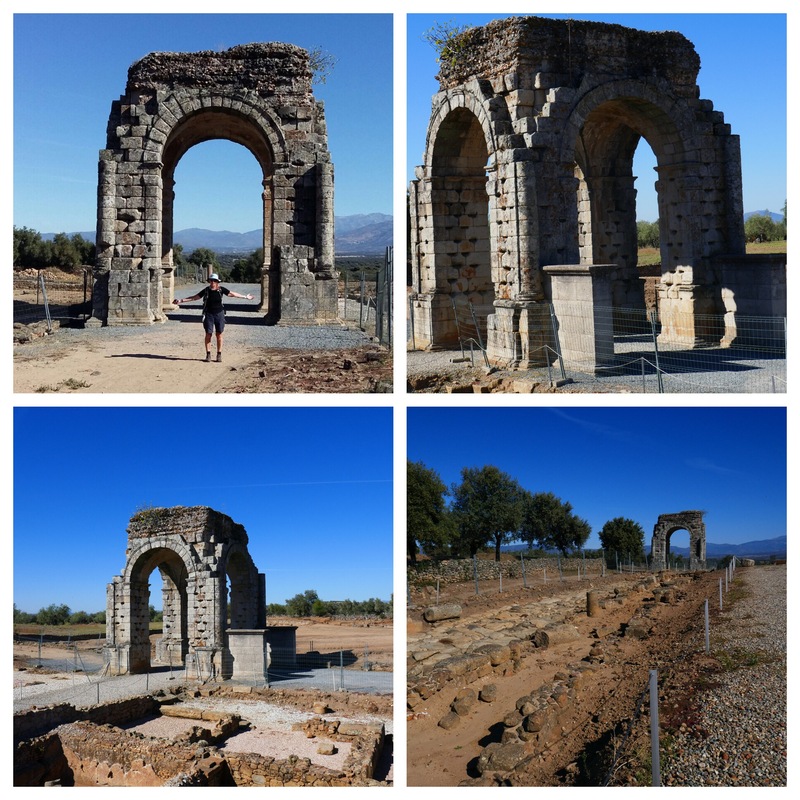 Today was a special day in 2 respects: the stunning scenery on the way here and the Roman Arch at Capárra. Except for the start, today we walked on tracks. Mostly we were alongside the old roman road or very near it. 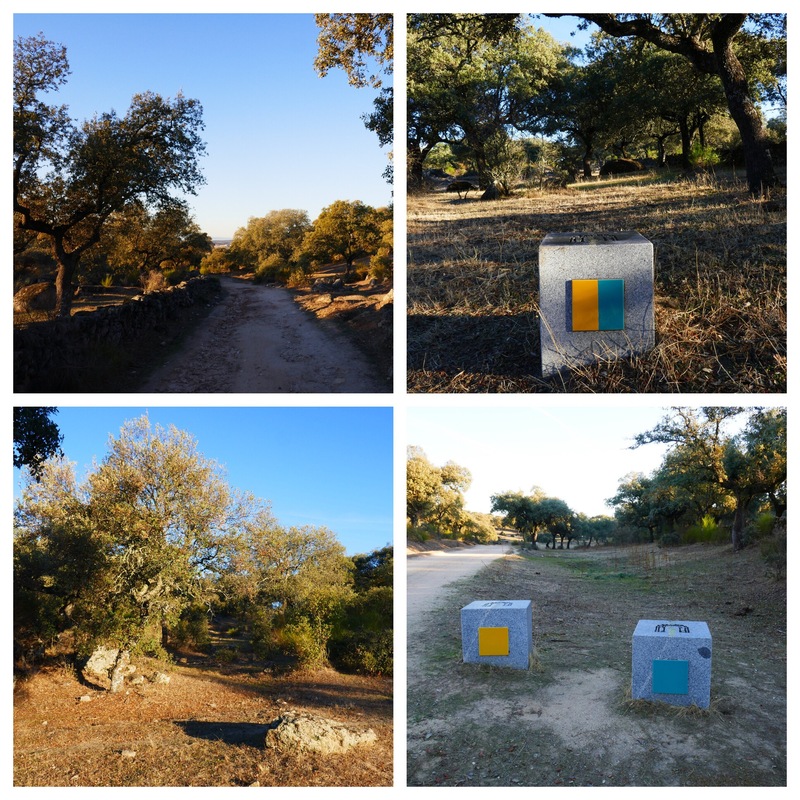 Roman roads are marked with green ‘tile’, the camino with yellow, and a shared track has both colours. Lots of this area is also used to graze animals – a ‘long paddock’ – and is between old stone fences that continue for most of the distance. The light changed as the sun rose higher. 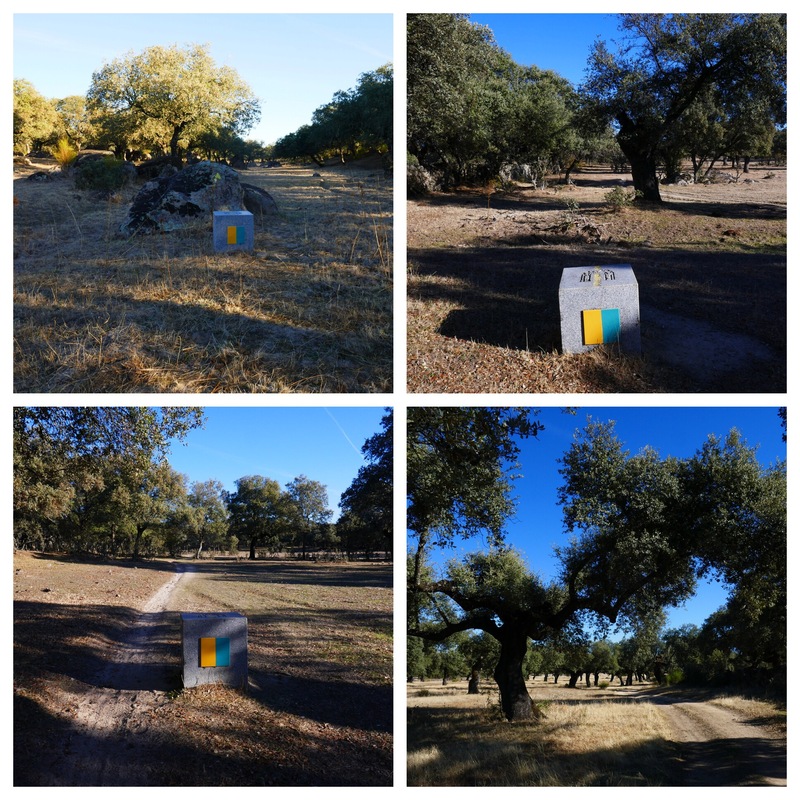 Lots of old oak trees, open grazing areas. Wow. 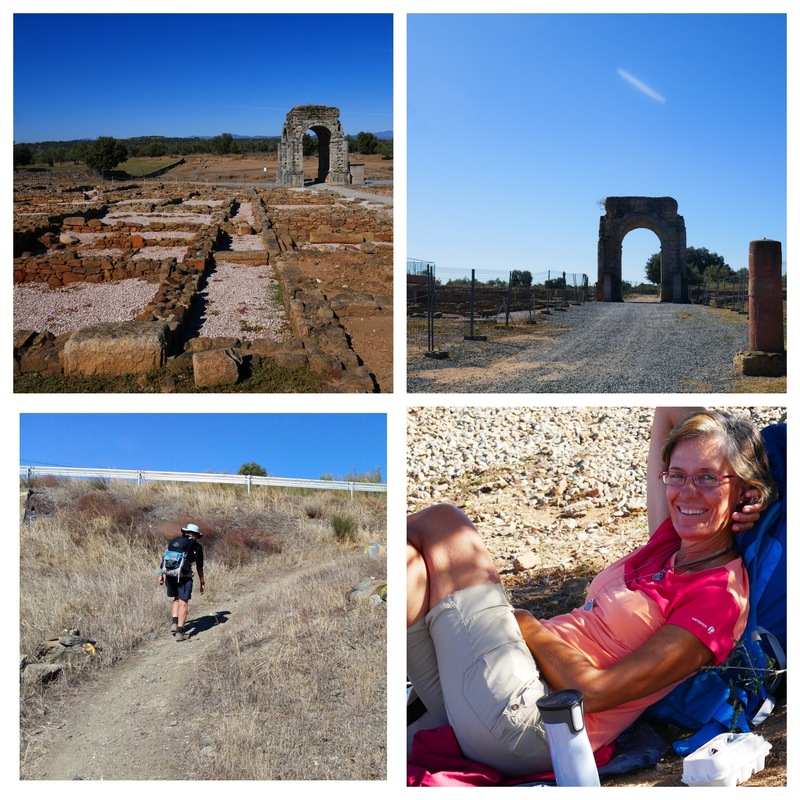 Really is one of my favourite sections between Merida and Salamanca. Yes, if you have time to walk only a short section of the Via de la Plata then this probably should be it. If not from Merida, then from Casar de Cáceres. Stunning! Last time I was here the Roman Arch of Capárra was in the middle of a farming area. Now it’s in an archeological site with its own interpretation centre (and a machine that mislabels cans of drinks). Actually unbelievable. Some inscriptions on the Arch are still legible and however you look at it, it’s astounding. 2,000 years nearly. Wow! And more of the original road leading to it from the city gates, originally in very thick city walls, have now been excavated. 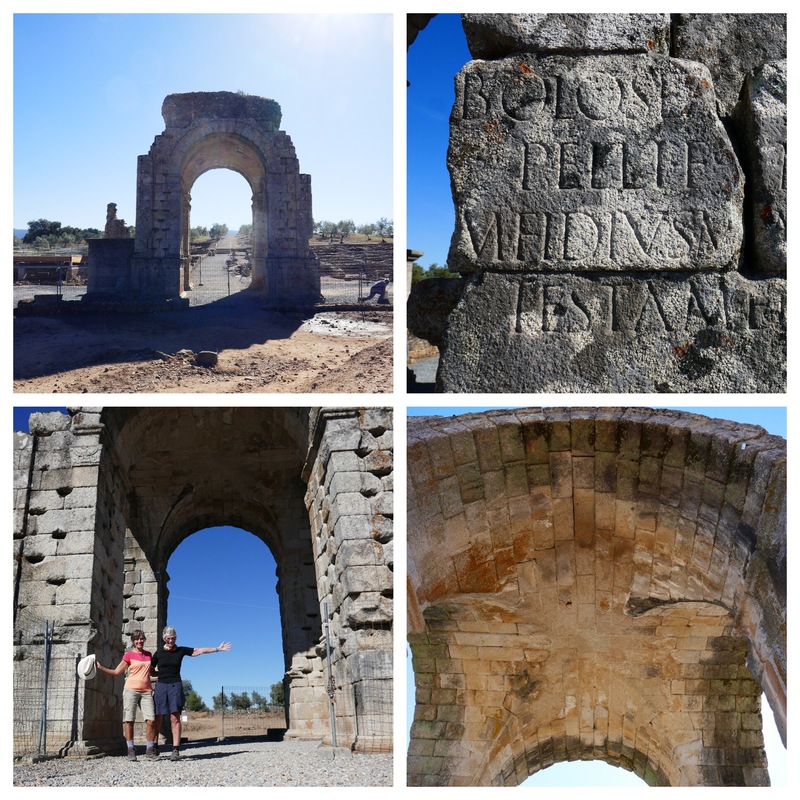 The Roman Arch at Capárra is truly amazing. Apologies for banging on about it but it is amazing. Once apparently in the centre of the Roman town of Caparra, it still stands proud with this section of the camino passing under it, 2,000 years later. Now it is surrounded by recent excavations. Four and a half years ago there were sheep. Not now. 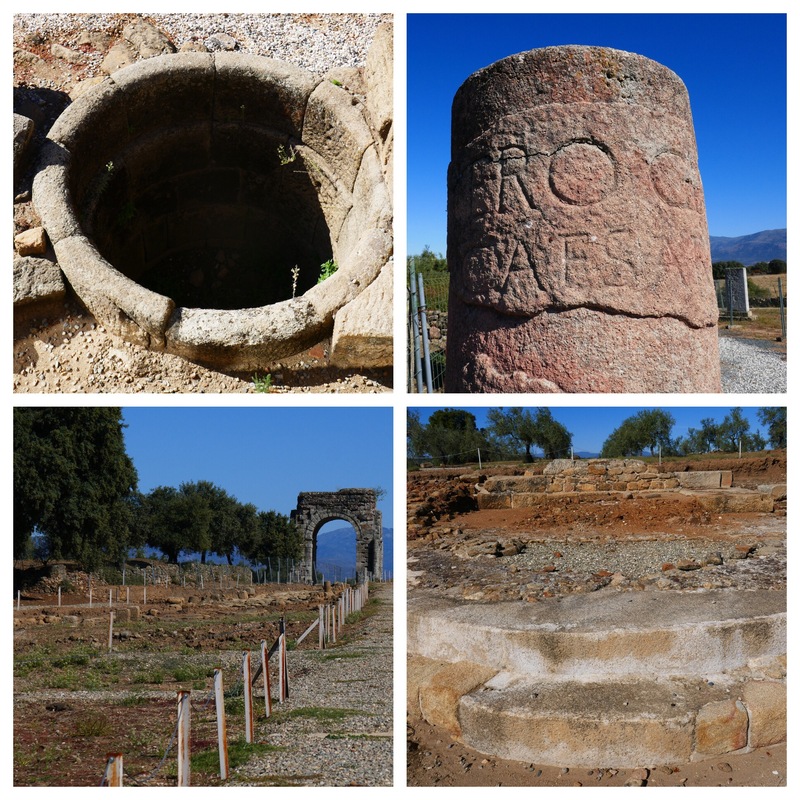 The excavations have exposed the remains of temples and the main square as well as of public baths, entrances through the city walls, shops alongside a terrace. And there is a huge area yet to be excavated. Hard to do it justice with photos or words. Visit it if you can! And the ‘ugly’ peregrino of the day, from Malaga, was at Capárra. We’d arranged for a lift from Capárra to a nearby hostal. As we waited 3 peregrinos arrived. Two absolutely collapsed under the Arch and one came towards us. A cocky middle aged guy who managed to piss off V in about 10sec as he dismissed our distance today (about 20km) as insignificant and generally made himself out as a very big man doing 35+ each day. You know the sort, looks women up and down like goods on offer and big notes himself. Yawn. Yawn. What is this walk you are doing? Continuation of vía de la Plata from junction with Camino Mozarabe. It’s a great walk!